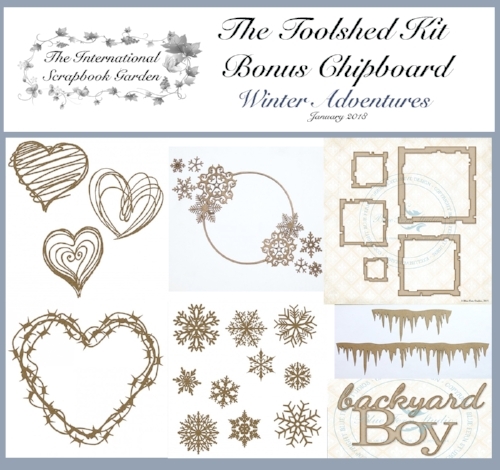 Hey everyone, I'm back today to share my last layout for February created using the Toolshed kit: Winter Adventures from The International Scrapbook Garden. 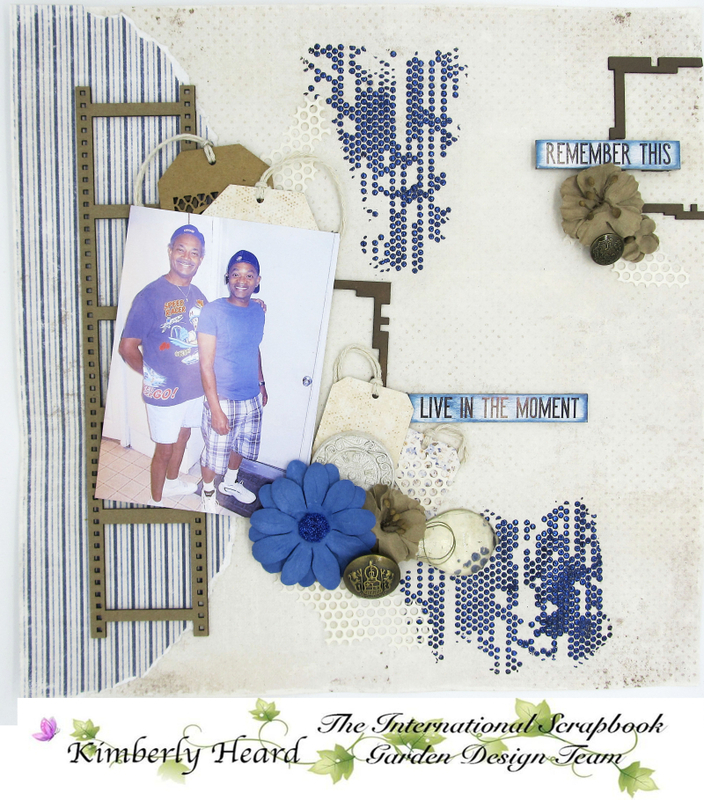 This kit is filled with the Denim and Friends paper line from Maja Designs. I love this photo of my dh and his very good friend. They look like kids who just got caught doing something they had no business doing. I tried to keep with the playfulness of the photo. 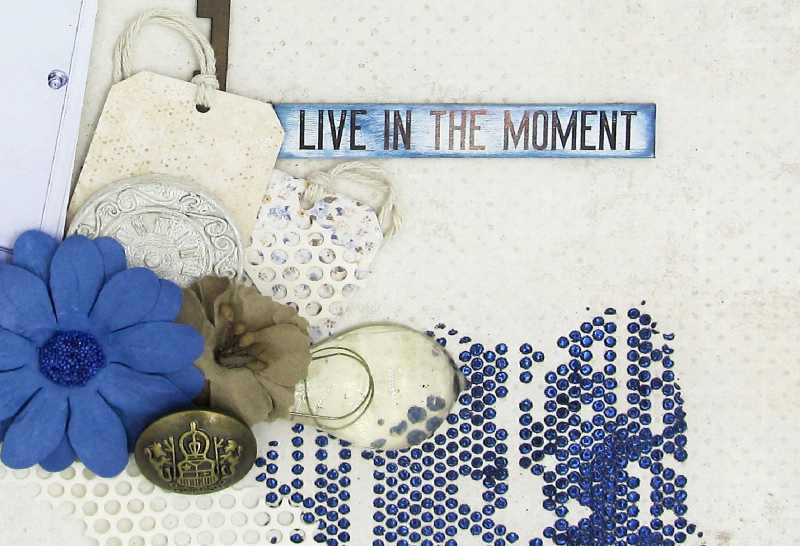 This kit is filled with a lot of fun embellishments. I used items from the main kit as well as the bonus embellishment and bonus chipboard kit. I pulled in a few things from my stash just to add to it. I used a stencil and some modeling paste both from my stash for the background. Then I added a bit of blue embossing powder to the wet modeling paste. I did some more paper tearing. I also cut some scraps of paper into tags to use. There are fun chipboard pieces and embellishments in the main kit as well as the chipboard bonus kit. I did grab the filmstrip piece from my stash. In most of my masculine layouts I like to leave the chipboard raw. The flowers are from the bonus embellishment kit. The buttons are in the main kit, so is that awesome clock resin piece. The title pieces are from the bonus embellishment kit. I inked the edges with the blue ink from the main kit.